Q&A session on academic careers showing the diversity in academic track records, complemented with a presentation on how to become a professor. Alain Dupont, MD, PhD, is full professor and head of the Department of Pharmacology at VUB, and head of the Department of Clinical Pharmacology and Pharmacotherapy at UZ Brussel. Not only does he have a stellar academic track record, as former dean, chair of the ZAP Selection Committee and president of several councils, boards and committees, he knows the university and the hospital and their policies inside-out. Dr Ilse Rooman (mother of two) is currently Associate Professor at VUB heading a group within the Oncology Research Centre. Her scientific career started off at VUB and involved two long stays abroad in medical research institutes in Spain and Australia, as well as activities outside of academia. Leo van Grunsven graduated as a Biologist from the University of Utrecht, obtained his PhD in France and did his Post-doctoral training in laboratories at the NIH, KULeuven and the VUB. He currently heads a small research team at the VUB focusing on chronic liver diseases and is director of the VUB doctoral school in Life Sciences & Medicine . 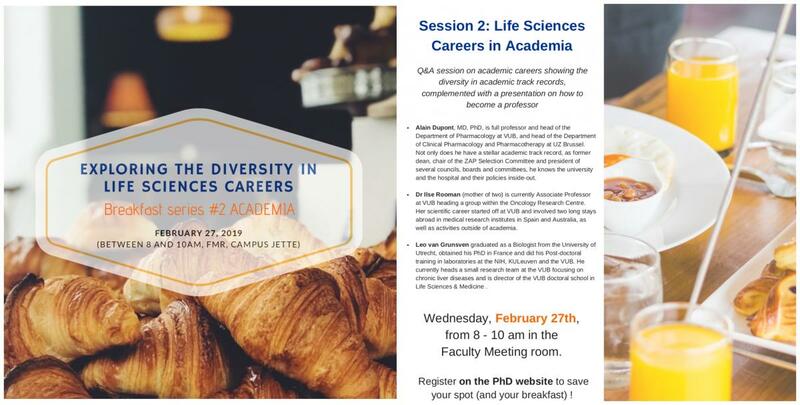 Career stories will be shared, career choices will be explained, tips and tricks about continuing in academia with your PhD will be given, and most importantly your questions will be answered.